On March 13, the The Society of Teaching Scholars held the 19th Annual Celebration of Excellence in Medical Education. 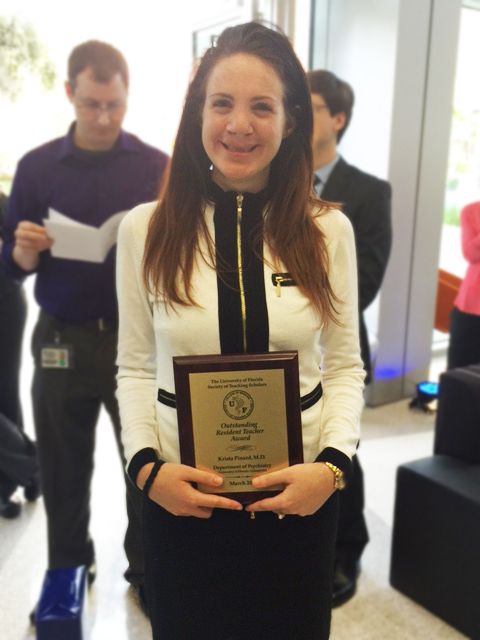 We are pleased to announce we had several faculty and PGY-3, Jessica Khan, MD honored in the ceremony. Stephanie Garayalde, MD has been selected for the 2019 American Psychiatric Association (APA)/APA Foundation (APAF) Child and Adolescent Psychiatry Fellowship Program. The fellowship is designed to promote interest and a career in child and adolescent psychiatry. Dr. Garayalde will receive funding to attend two APA Annual Meetings and two APA Components Meetings. 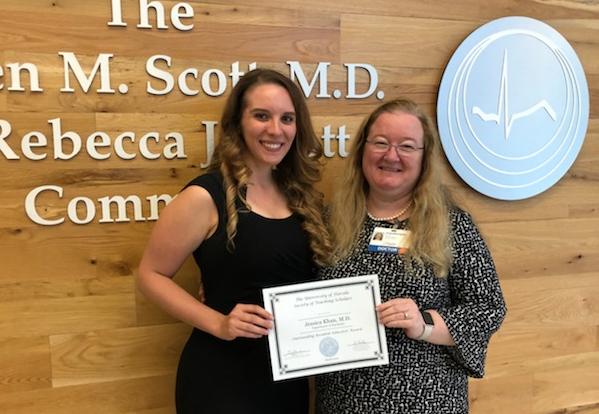 She will also receive mentorship from child and adolescent psychiatrists and leaders in the field, attend scientific sessions, and participate on an APA council where she will establish relationships and peer-mentorship with other residents and fellows with similar career goals. The Society for Teaching Scholars hosted the 17th Annual Celebration of Excellence in Medical Education Reception in the Steven M. Scott M.D. and Rebecca J. Scott Commons of the George T. Harrell, M.D. Medical Education Building. 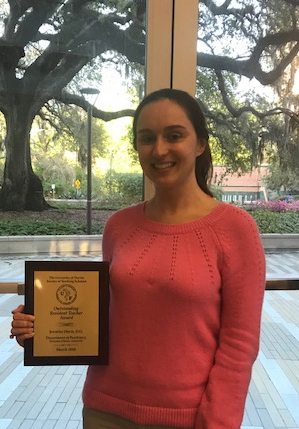 This year’s Outstanding Resident Educator Award was presented to Jennifer Davis, DO. 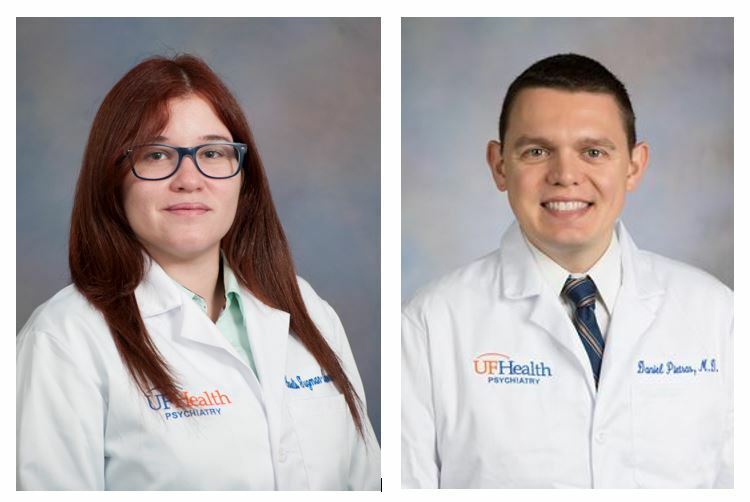 We are pleased to announce that Dr. Yarelis Guzman-Quinones, PGY-3 and Dr. Daniel Pietras, PGY-3 are the recipients of a Florida Psychiatric Society (FPS) Alliance Grant. This grant is to assist with attendance at the FPS Fall Meeting, September 23-25 in St. Petersburg, Florida. Drs. Guzman-Quinones and Pietras will also attend FPS committee meetings to help them better understand the organizational and advocacy aspects of Psychiatry as well as network with current and future colleagues. They will be recognized at a dinner reception during the meeting. Please join us in congratulating Drs. Guzman-Quinones and Pietras for their grant award! Dr. Burns has been appointed to the Florida Psychiatric Society’s (FPS) Membership Committee. She will be one of three Resident-Fellow Members to serve on the committee alongside five general FPS members. She was appointed by her residency training director, Dr. Jacqueline Hobbs. 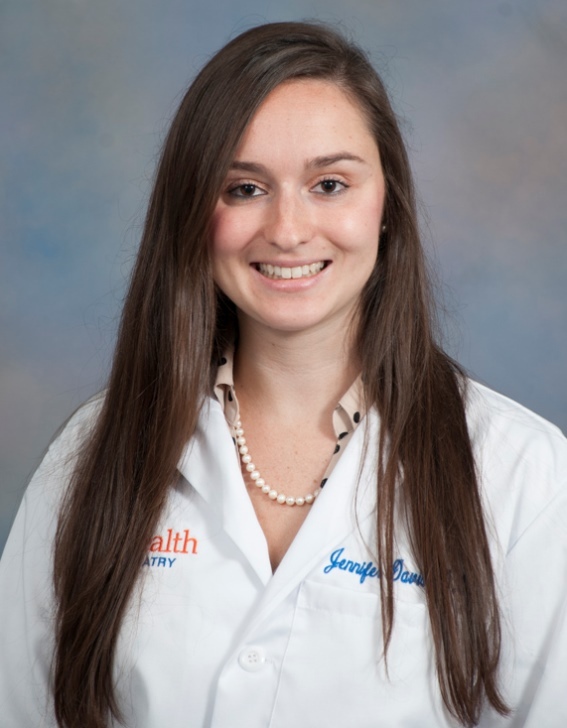 We are happy to announce that Jennifer Davis, MD – PGY-2, has been appointed as a member of the Association of American Medical College’s (AAMC) Organization of Resident Representatives (ORR). She was appointed by the American Association of Chairs of Departments of Psychiatry (AACDP) after a competitive national search. The ORR meets twice annually, once during AAMC’s fall meeting and again in conjunction with the Council of Academic Societies (CAS) spring meeting. The AAMC will provide all funding required for Jenny’s travel. This will be an incredible opportunity for Jenny to learn more about academic medicine at the national level. We are so proud of Jenny. Please join us in congratulating her. Dr. Davis has been selected to represent the housestaff on the Graduate Medical Education Committee (GMEC). The Graduate Medical Education Committee (GMEC) is responsible for establishing and implementing policies and procedures, overseeing program’s compliance with ACGME program guidelines, and reviewing all program changes. Her term will last for two academic years. 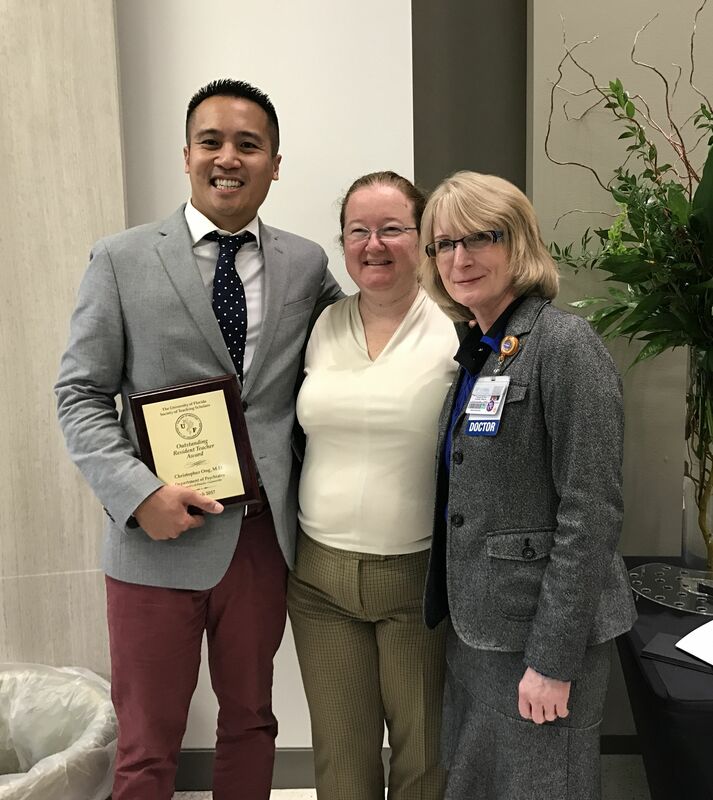 Department of Psychiatry residents Camilo Leal, MD and Christopher Ong, MD have been nominated by residents and selected by the committee to receive membership into the Gold Humanism Honor Society (GHHS). 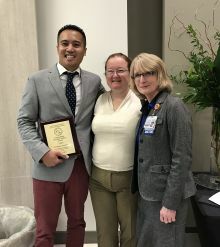 The mission of the Gold Humanism Honor Society is to recognize individuals who are exemplars of humanistic patient care and who can serve as role models, mentors, and leaders in medicine. 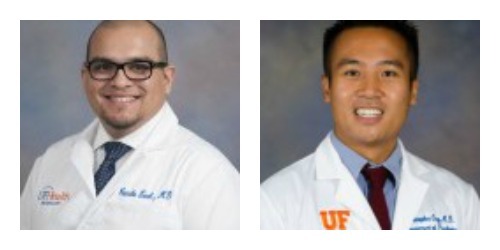 Leal and Ong are two of 13 resident/fellows from the University of Florida that have been selected by our UF Resident Chapter of the Gold Humanism Honor Society for 2016. This membership is a national honor, and Electronic Residency Application Service (ERAS) now allows indication of involvement on par with Alpha Omega Alpha Honor Medical Society. We would like to congratulate Dr. Leal and Dr. Ong on standing out among their peers as role models of excellence in compassionate medical care. There will be an induction ceremony held Thursday, May 5 in the new Harrell Medical Student Building. Please join us in congratulating Dr. Leal and Dr. Ong on their outstanding accomplishments. The Society for Teaching Scholars hosted the Sixteenth Annual Celebration of Excellence in Medical Education Reception in the Steven M. Scott M.D. And Rebecca J. Scott Commons of the George T. Harrell, M.D. Medical Education Building. 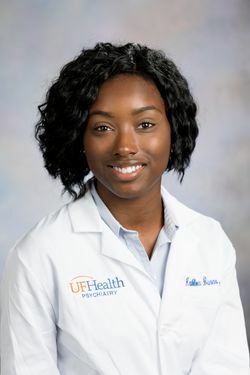 The University of Florida, College of Medicine’s Celebration of Research is a wonderful opportunity to reflect on the strength of the research programs and appreciate the breadth, quality, and merit of the science conducted within the College. This event reminds us that it is through discovery and the impact of our research that we improve the quality of human life, and in doing so, advance the College of Medicine and the University of Florida. 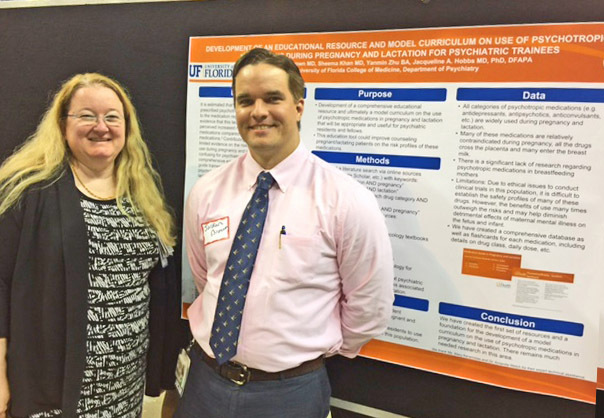 The poster session event was held at the Stephen C. O’Connell Center, Monday, February 22, 2016. Jordan Brown, MD presented the poster entitled “Development of an educational resource and model curriculum on use of psychotropic medications during pregnancy and lactation for psychiatric trainees.” The research was conducted by Jordan Brown MD, Sheema Khan MD, Yanmin Zhu BA, and Jacqueline Hobbs MD, PhD, DFAPA. 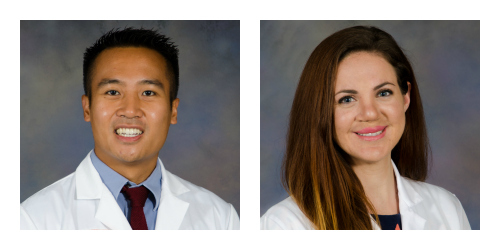 We are pleased to announce that our new 2016-17 Administrative Co-Chief Residents are Drs. Christopher Ong and Krista Pinard. Please join me in congratulating them and in welcoming them into their new positions which will officially start May 1, but there will be a transition period with our current chiefs. We look forward to working with our new chiefs. I also want to take this opportunity to thank Jordan and Marc for all their hard work this year. I know they will also help to make the transition a smooth one. It is our pleasure to announce that Bruce Bassi, PGY-2, has been named a 2016 American Association for Geriatric Psychiatry Honors Scholar! He was selected from a very competitive national applicant pool. 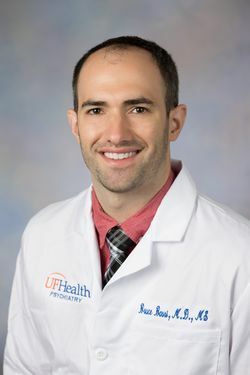 For this prestigious scholarship, he will receive a one-year membership in the American Association for Geriatric Psychiatry (AAGP), airfare and three nights’ hotel accommodation to participate in the Scholars Program held in conjunction with the AAGP Annual Meeting, full registration to the AAGP Annual Meeting, participation in ongoing AAGP activities such as AAGP committee initiatives, an academic project related to geriatric psychiatry working with an assigned mentor, and other unique opportunities. Upon completion of his scholarly project, he will present the findings at the following year’s meeting as well. This is yet another amazing national-level opportunity for one of our residents. We are on a roll as this is our second year in a row to have one of our residents selected for this opportunity (Andrew Pierce, MD received this last year). Please join us in congratulating Bruce on his AAGP scholarship. Dr. Christopher Ong, PGY-3, has been nominated for a Physician Recognition Award. Chris will be honored at an award recognition luncheon later this month. Please join us in congratulating Chris on his award and dedication to our profession. 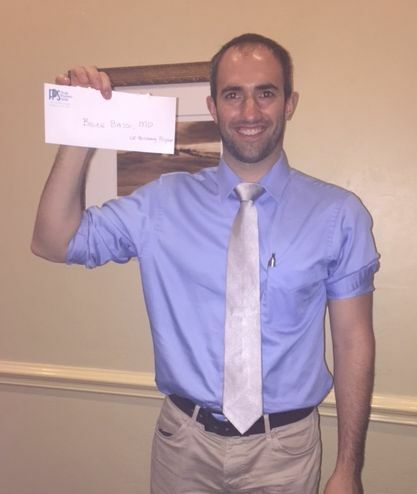 We are pleased to announce that Dr. Bruce Bassi, PGY-2, is the recipient of a Florida Psychiatric Society (FPS) Alliance Grant. This grant is to assist with attendance at the FPS Fall Meeting, September 18-20. Dr. Bruce will also attend FPS committee meetings to help him better understand the organizational and advocacy aspects of Psychiatry as well as network with current and future colleagues. He will be recognized at a dinner reception during the meeting. Please join us in congratulating Bruce for his grant award. Congratulations to our Mind Games Team! We a re very proud to announce that our program’s Mind Games team consisting of Mahdi Razafsha, MD (team captain), San Chang, MD and Krista Pinard, MD placed 18th out of 99 programs nationally in the first-round Mind Games online competition. This round consisted of the team having to answer 150 multiple choice questions in 60 minutes, no easy feat, as the best times and number correct count towards ranking. Even though our team was not in the top 3 teams to advance to the finals at the APA, we are still so proud to be in the Top 20! If you are going to the APA in Toronto, you can see the live Mind Games competition on May 19th. It’s a lot of fun to watch. See who made the finals here. It is our pleasure to announce that Andrew Pierce, PGY-2, has been named a 2015 American Association for Geriatric Psychiatry Honors Scholar! He was selected from a very competitive national applicant pool. For this prestigious scholarship, he will receive a one-year membership in the American Association for Geriatric Psychiatry (AAGP), airfare and 3 nights’ hotel accommodation to participate in the Scholars Program held in conjunction with the AAGP Annual Meeting, full registration to the AAGP Annual Meeting, participation in ongoing AAGP activities such as AAGP committee initiatives, an academic project related to geriatric psychiatry working with an assigned mentor, and other unique opportunities. Upon completion of his scholarly project, he will present the findings at the following year’s meeting as well. This is yet another amazing national-level opportunity for one of our residents. Please join us in congratulating Andrew on his AAGP scholarship. Congratulations to Dr. Marc Ettensohn for earning the ABPN Fellowship Award! Jacqueline Hobbs, MD, PhD is very pleased to announce that Dr. Marc Ettensohn, PGY-3, after a competitive national search and in-person interview with Dr. Faulkner, CEO of the American Board of Psychiatry and Neurology (ABPN), has been awarded a prestigious ABPN Senior Resident Administrative Fellowship for 2015-2016. This fellowship will provide Marc a 3-month experience at the ABPN office to become familiar with the structure and function of the ABPN, major regulatory and professional organizations in psychiatry and neurology (ABMS, ACGME, RRCs, FSMB, etc.) and crucial issues confronting these disciplines. Marc will work directly and travel with Dr. Faulkner to various national meetings, be introduced to leaders in the field, as well as perform a research project relevant to the ABPN. Funding will be provided by the ABPN. This is an amazing achievement for Marc. We are very proud of him. Congratulations to Drs. Marc Ettensohn and Andrew Pierce on their nominations to the Institutional Graduate Medical Education Committee (GMEC) as resident representatives. Please join us in congratulating Marc and Andrew! Both were selected by COM peer residents to represent the overall housestaff. The GMEC oversees 70 ACGME-accredited, as well as 44 non-ACGME training programs. The committee is made up of core program training directors, hospital and education leaders, GME administrators, and resident/fellow representatives. Marc and Andrew will learn a lot about the key leadership structure of the hospital and COM.